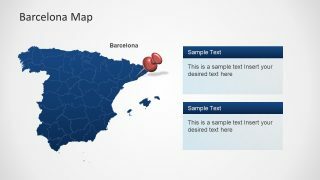 The Barcelona City PowerPoint Map features a sightseeing presentation of popular city of Spain. It is a visual aid for educators, tour guides or business employees that need to describe the highlights of the city. 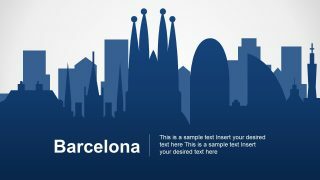 Ideal to support information about Barcelona and it most important places. For example, information about culture, sports, tourist attractions, education, food and more. 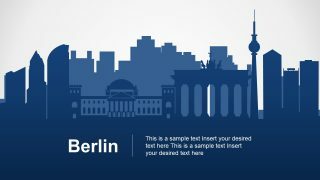 Hence, it is a brilliant tool for teachers to show the important cities of the world through interesting visuals. 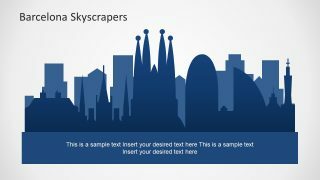 The Barcelona City PowerPoint Map contains amazing silhouette shapes of great architecture buildings and specific locations within a geographic map. 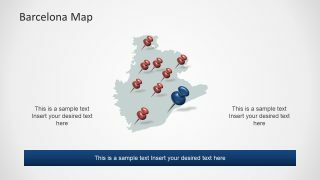 It also contains a data driven PowerPoint chart of multiple bars to describe data driven information related to the city. This world’s leading center of tourism, trade and culture has high presentations demand. 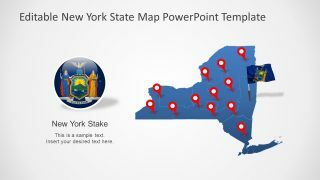 The teachers, tourist, business and marketing professionals can find this template resourceful for discussing one world’s major global cities. 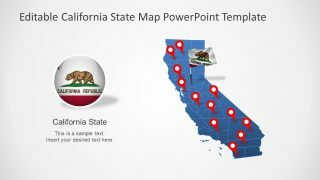 The simple Barcelona City PowerPoint Map template shows the incredible cityscape silhouette within a professional design layout; this helps the user to display its own content within the shapes and maps. The shapes contains famous architectural building of Barcelona as the “Sagrada Familia, designed by Gaudi, famous for uniqueness and because is under construction even now”. 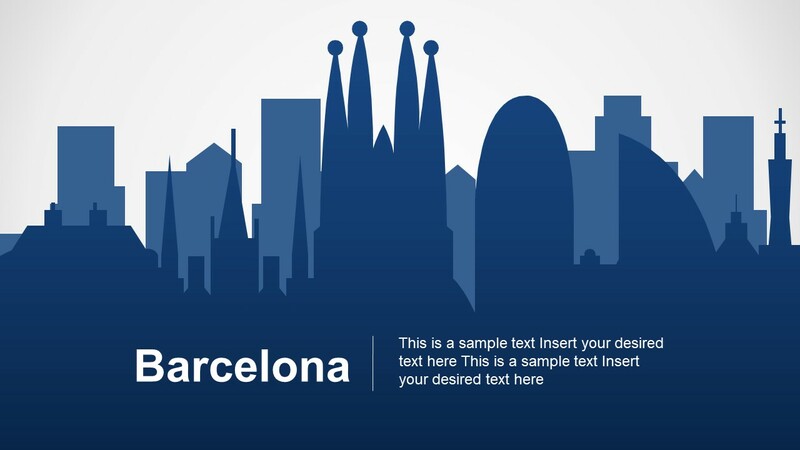 Further slides contain simple yet purposeful scenes showing the city of Barcelona. 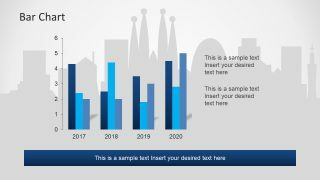 The PowerPoint maps show location pins and marker icons over the Barcelona city which are 100% editable. Whereas, the presentation also provides a complete map of Spain with star icon to highlight the Barcelona City. 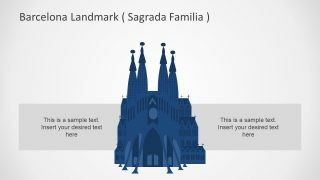 The seven slides of Barcelona city includes three map templates. 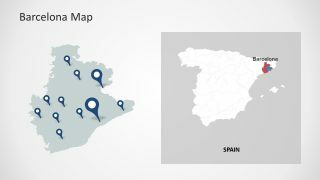 Specially, the blue Spain map outline contains the editable segments for each city. Therefore, the users can also highlight other cities of Spain along with Barcelona. 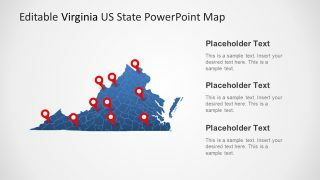 Users can find templates of other cities like Frankfurt, Washington DC and Portland for users.